FILE - U.S. and Philippine marines storm the beach to simulate a raid during joint U.S.-Philippines military exercises at a former U.S. naval base at San Antonio township, Zambales province, Philippines, May 9, 2014. 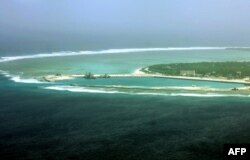 Some say China appears to be outmaneuvering its rivals in the race to assert claims over the vast strategic sea. In past two years, China has reclaimed at least 1,170 hectares of land in South China Sea, building upon small reefs, shoals and islets. 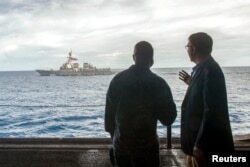 FILE - U.S. Secretary of Defense Ash Carter, right, speaks with U.S. Navy Cmdr. Robert Francis Jr., as Carter and Malaysian Defense Minister Hishammuddin Hussein (not pictured) visited the USS Theodore Roosevelt aircraft carrier in the South China Sea. “China’s cutting edge has been through a gray area of Coast Guard, paramilitary forces, and even the construction on the artificial islands is being masked as serving the public good, search and rescue, scientific activities, oil exploration, fishing,” said Southeast Asia security analyst Carlyle Thayer with Australia's Defense Force Academy in Canberra. In the last two years China has reclaimed at least 1,170 hectares of land in the South China Sea, building upon small reefs, shoals and islets. This week came another reminder of their efforts to fortify their existing outposts: the U.S. said China appeared to have deployed HQ-9 surface-to-air missile batteries on Woody Island in the Paracel chain. Thayer said China already has more coast guard ships than all the other nine ASEAN nations combined. With the weapons and military infrastructure Beijing is stationing on the man-made islands being built in disputed waters, some more than 800 kilometers from the mainland, China is gaining both a quick strike capability and naval superiority over other countries in the region. FILE - Part of the city of Sansha on the island of Yongxing, also known as Woody island in the disputed Paracel chain, which China now considers part of Hainan province. The U.S. military has built closer ties with ASEAN nations, in particular Vietnam and the Philippines, which have contested China’s territorial claims. That has not meant, however, that ASEAN has banded together to address the South China Sea issue. ASEAN, with its emphasis on consensus building and non-interference, has been reluctant to publicly stand with the U.S. to support any meaningful action against China. "ASEAN countries haven’t really asked of Uncle Sam what they want Uncle Sam to do," Choong said. Still, American influence in the region has increased as a result of Obama’s commitment to more fully engage with Southeast Asia and to personally participate in annual forums like the East Asia Security summit, Southeast Asia security analyst Thayer said. “Obama is leaving a legacy that a new American president would ignore at their peril,” he said. 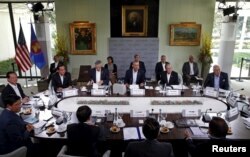 U.S. President Barack Obama hosts a meeting with leaders from the Association of Southeast Asian Nations (ASEAN) during a summit held at Sunnylands in Rancho Mirage, California, Feb. 16, 2016. In recent years, Washington has been moving more troops and military assets into the region and strengthening security alliances with a number of ASEAN members. Admiral Harry Harris, commander of the U.S. Pacific Fleet, said the Navy has already brought its “newest and most capable” military equipment to the area, like the P-8 surveillance airplane, the Littoral Combat Ship, the Virginia-class submarine, and new amphibious ships such as the USS America. In Australia last year, over 1,000 U.S. Marines were deployed to the city of Darwin to join in exercises with Australian Defense Forces. By 2017, the number of rotational deployments will increase to 2,500. 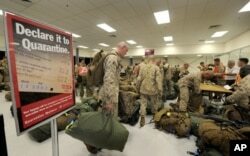 FILE - United States Marines complete quarantine checks as they arrive at a Royal Australian Air Force Base in Darwin. The Philippines’ Supreme Court recently endorsed a bilateral security cooperation agreement that will station U.S. troops and weapons on a rotational basis at five Philippine military airfields and two naval bases. The return of the U.S. military to the Philippines is seen by supporters as a significant deterrent to China and comes 25 years after Manila voted to close U.S. military bases in the country at the end of the Cold War. Washington is also providing maritime assistance to other ASEAN nations, including Vietnam, which is receiving several refurbished U.S. Coast Guard patrol ships. These increased capabilities in Southeast Asia are complemented by extensive U.S. military bases and deployments in Guam, Japan and South Korea.